Who doesn't like watching Horror Movies? Well, to be honest I'm not really in to Horror movies unless I'm with my friends. I don't even watch Horror movies at home since most of the time I'm alone but I know that people likes watching Horror movies because of the thrill of being afraid. Even though the fact that these entities and creatures are not real, movies will always instill fear on every audience regardless of gender or personal belief. 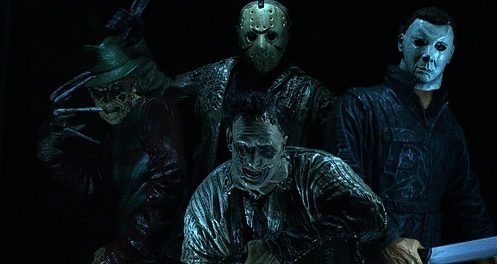 Through the years there have been several good Horror movies released worldwide. Most of them will really scare the hell out of you and some is not scary at all. These movies received enough recognition and became cult classics that movie enthusiasts enjoys watching over and over again. With movies like Final Destination 5 and the Fright Night Remake coming later this year, let's go back down the memory lane. Below is an infographic that features most of the iconic Horror films from the 70's (The Exorcist) until 2009 (The Paranormal Activity). The illustration shows the stats proportionality of Gross revenue and Budget allocated to produce the film. A very interesting infographic we got here. This shows that most Horror films doesn't require too much budget and earns a lot in return. Also with the dawn of Asian horrors, the use of special effects is lessen in favor of practical effects that is much cheaper but realistic. But with the popularity of fantasy and super hero movies, lately we don't get much of good horror movies. Good thing there are some coming later this year. Can't wait to see another scary movie... of course with friends he he.